When I was growing up, my mother would bake all the time. I mean, all the time. That’s how our Famous Heitmann Cookies got to be so famous. They went everywhere with us, to every function. And if they didn’t, well…there was some hell raised, or at least a half-joking-but-not-really comment like, “What, no cookies this time?? Come to find out, my mother bakes as a form of stress relief. That is how she unwinds after a long and stressful day. Is it a coincidence that I recall a big spike in cookie making around my adolescent years? I think not. 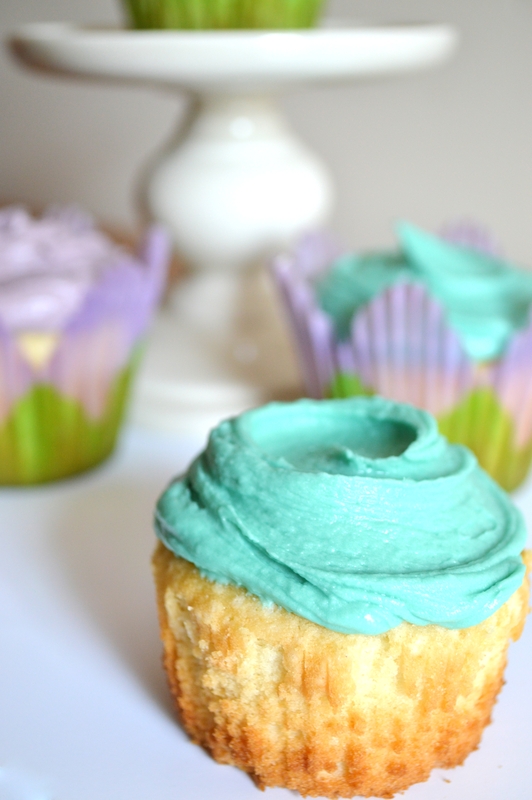 A week or so ago, I posted a many-tweets-long recipe for vanilla cupcakes which is my go to recipe. Along with that tweet, I promised to publish a blog post with the recipe in a concise format, not spread throughout 6 or 7 tweets, haha. I love a good, rich vanilla anything – ice cream, cupcake, pastry, etc. Vanilla often gets a bad rap for being bland, but before that, we had practically nothing! Vanilla was an exotic spice at one time, and was used not only for food consumption, but also as a beauty product. Women used to dab a bit of vanilla behind their ears when perfume was too expensive. I found the base to this recipe on allrecipes.com and like I do with everything, I tweaked it a bit. This recipe is the one I go to for making my cakes. It s perfect on its own, does well with fun additions like fruit, sprinkles, or whatever else comes to mind. It’s also SO super easy, and just as easy as making a box cake, yet a thousand times better. Enjoy, happy baking! Mix the first four ingredients together, adding one at a time. Because I’m a time saver (read: lazy and don’t want to wash extra dishes; but then again, I am saving water by not adding more dishes, so I’m also a doing good things for the planet! Go me!) I don’t bother with mixing my dry ingredients in a separate bowl, especially when there are only two. For this I put both of them on top of what’s already in the bowl, then I make sure I mix really well. Now, for the last ingredient, I like to se whatever is richest on hand. Today it was half a half. I’ve used heavy cream (my favorite) and whole milk (also very good). Mix that in, pour into 12 cupcake liners and bake at 325 for 15-20 minutes. You can also use a 9 inch round pan and bake at 325 for about 25 minutes. Ovens are so tricky, so it’s best to keep an eye on it and test when you think it may be done. Your tester or knife should come out mostly clean when checking in the middle. Let them cool and frost! 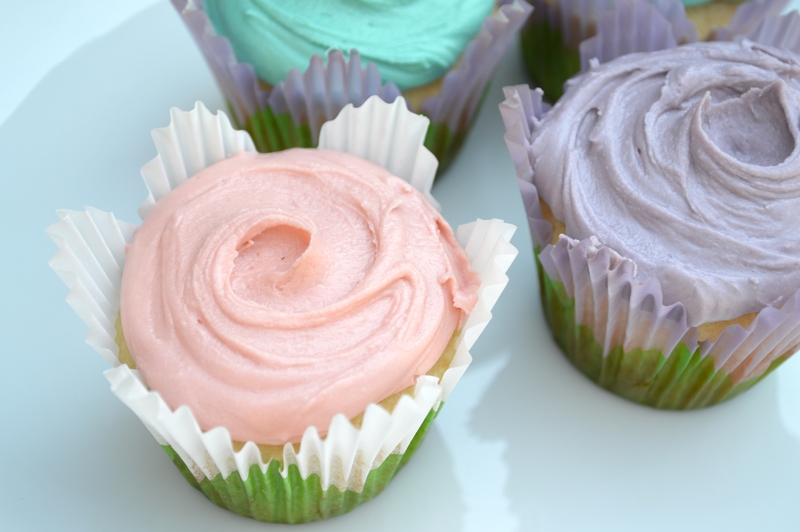 I like to use my buttercream on these, and the recipe is below. 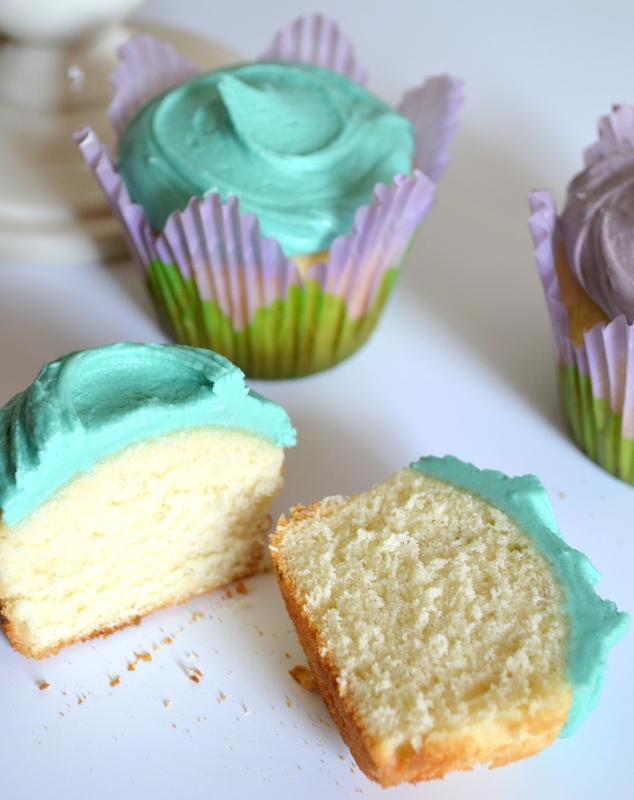 This is a good thing to whip up while the cupcakes are cooling after you’ve done all your dishes. Sometimes I add a little bit of water to get things going when mixing. Mix ingredients together and hope you don’t make too big of a mess! And of course the last step is to share with friends and enjoy! So easy, right? Shoot me a message one any one of my social media platforms (Facebook, Twitter, Instagram) – I’d love to see photos of your finished creations and hear how your baking experiences went!